MEDWING conducted a survey on the current working conditions in the care sector and compared the statements of certified staffs and nursing assistants. In the first part we explain the term "nursing assistant" in more detail before analyzing the statements of the different groups with regards to the selection of departments and the respective areas of responsibility. Especially the areas of responsibility demonstrated some clear differences within both groups which leads to the assumption that the particular tasks and levels of responsibility could directly have an impact on the perceived fun at work. 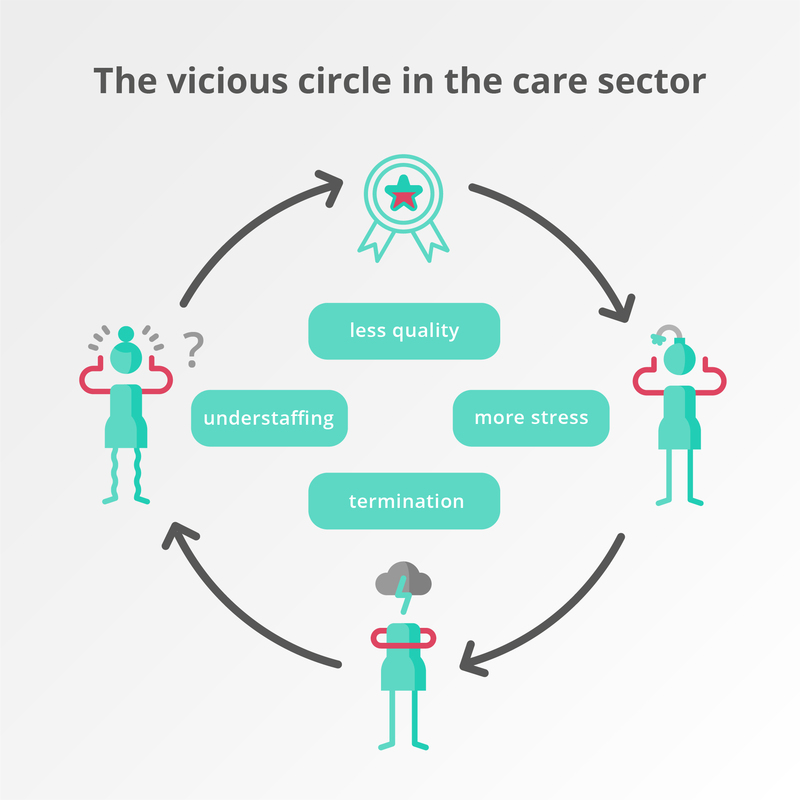 The last part addresses the vicious circle in the care sector in general. The key finding of the analysis is the fact that nursing assistants generally enjoys work more than certified staff. Besides general statements on job position, carrier or department types participants of the survey answered questions on the current working conditions in the care sector 2018. Over 2,700 staffs from the care sector participated in the survey from nurses, caregivers up to care managers, charge nurses or residential care managers. Over one half of all participants are certified staffs and around one quarter are nursing assisants. In the second part of our survey we have already reached the conclusion that in ambulatory care services as well as in inpatient care facilities staffs enjoy work the most. 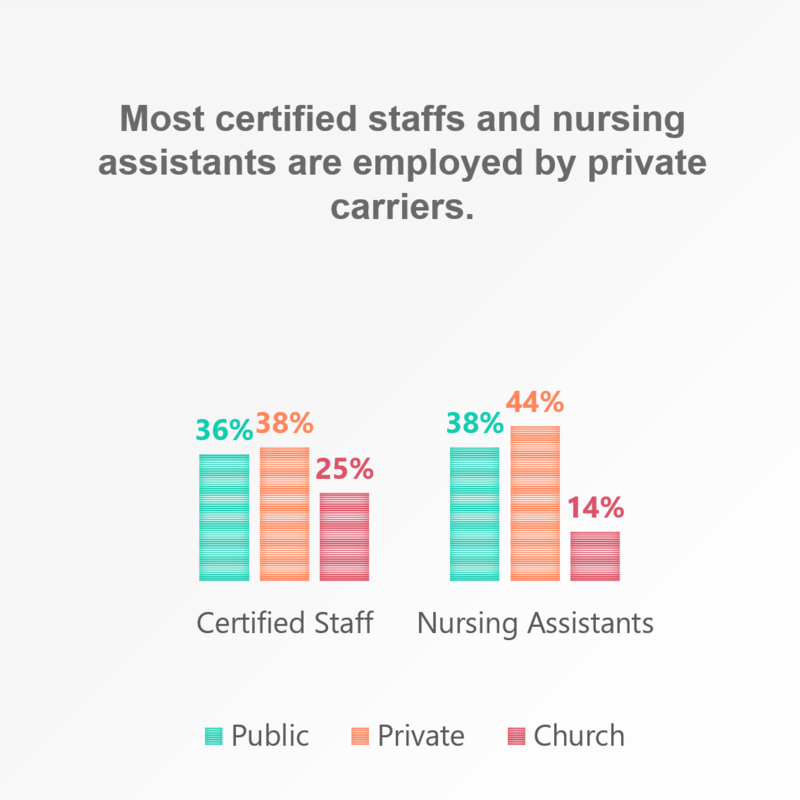 Since around 76% of all assistants work in ambulatory care services or inpatient care facilities we will now take a closer look at the differences between certified staffs and nursing assistants. What exactly does "nursing assistant" mean? What should be taken into consideration in this analysis is the fact that the job position "nursing assistant" is interpreted very differently among the different states and facilities in Germany. While in some parts of Germany a "nursing assistant" needs to surpass an apprenticeship of two years, in some facilities a course of three months is sufficient. Accordingly, the areas of responsibility for nursing assistants can be very different: from dressing the patients, serving food, cleaning the room up until simple medical tasks like measuring the blood pressure everything can be performed by a nursing assistant. In some facilities nursing assistants are even allowed to administer medicine under a nurse's charge. However, before taking a closer look at the different working conditions for both job areas we will take a closer look at the different backgrounds of the survey participants; here we have already identified some interesting results. 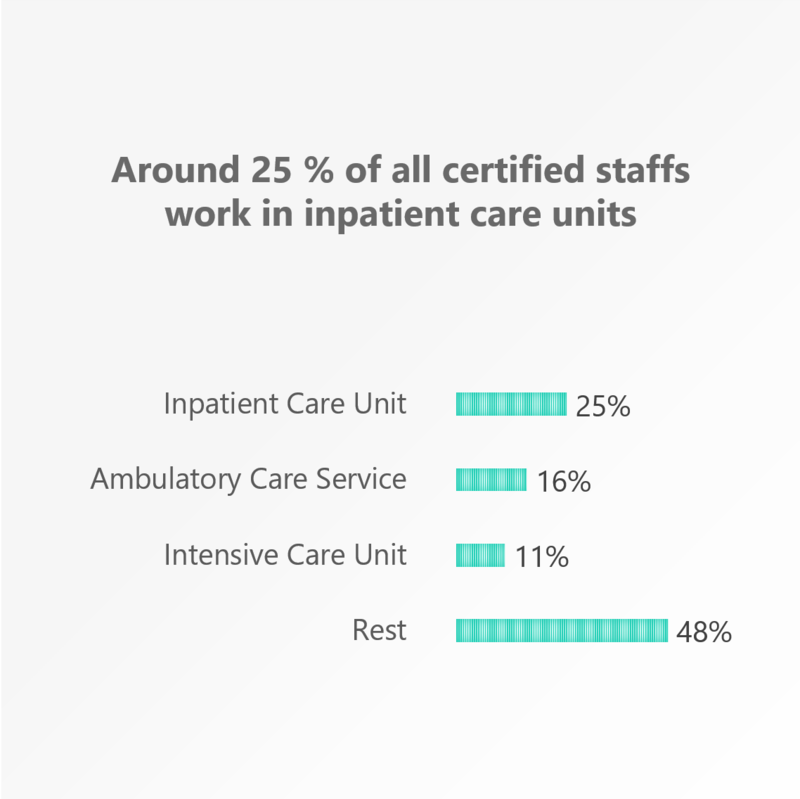 For example, one quarter of the certified staffs states to work for inpatient care units. Around 16% are employed by ambulatory care services and 11% work in the intensive care unit. ﻿Generally, around 38% of certified staffs are employed by private carriers, followed by public carriers. For nursing assistants, the results are very similar. Around 44% work for private carriers, followed by 38% who are employed by public carriers. ﻿However, with regards to the different departments there exist some differences between both job areas. 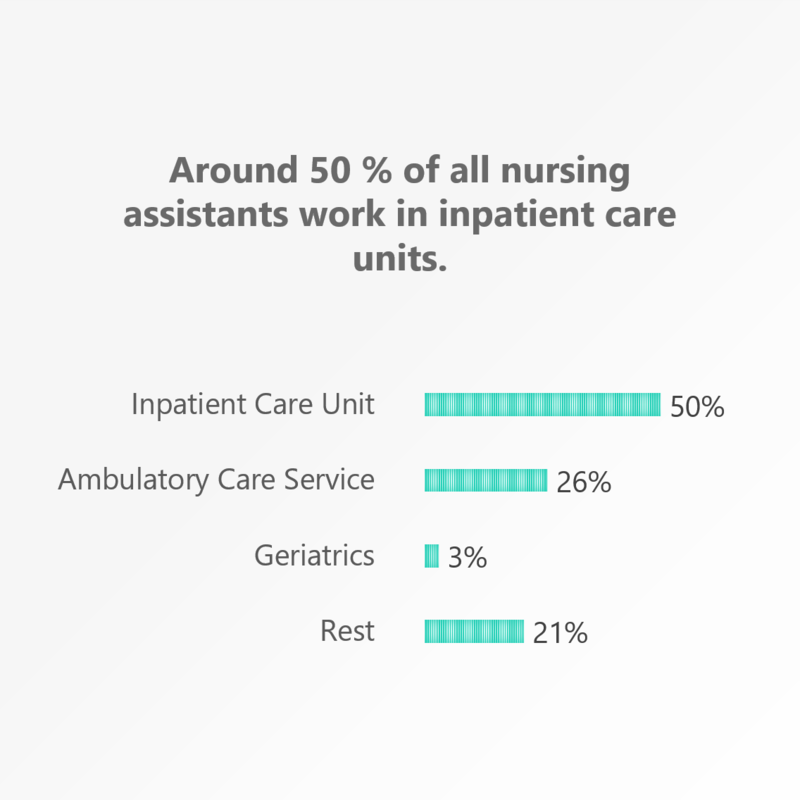 Around one half of all nursing assistants works in inpatient care units and over one quarter is employed by ambulatory care services. Only 3% work in a hospital in the geriatric department. Generally, especially nursing assistants have fun at work, even more than certified staffs. Over one half of all nursing assistants state to have fun at work while only 40% of certified staffs claim the same. This difference can have different reasons. One possible reason could be the fact that most nursing assistants work in inpatient care units. In the previous article for example, we have already reached the conclusion that especially in inpatient care units and ambulatory care services the patient's appreciation is very high. Besides more fun at work nursing assistants also claim to feel more appreciated by the patients than the certified staff. 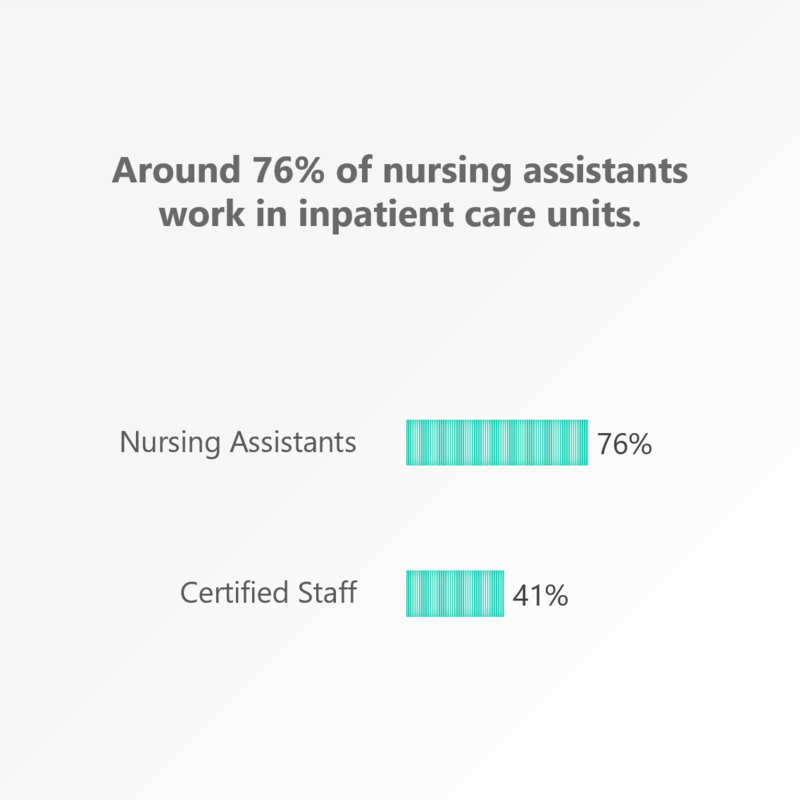 Around one half of all nursing assistants feels appreciated by the patients meanwhile only one third of the certified staffs states the same. Another factor that could play a role for the analysis are the different areas of responsibility and ambitions of both work groups. Unfortunately, it wasn't possible to capture the exact education and areas of responsibility of the nursing assistants. Still, it can be assumed that nursing assistants usually spend more time with the patients due to their assisting tasks such as serving food or cleaning the room. The more time they can spend with the patients the easier it is for them to build interpersonal relationships with them. The certified staffs however often criticize the lack of personnel in the facilities which forces them to constantly rush from one place to another and leaves not much time for the patients. Besides the lack of time for the patients certified staffs usually face higher responsibilities. While nursing assistants only execute assisting tasks certified staffs are completely responsible for the patients. In times of chronic understaffing this high amount of responsibility can lead to an increased stress level which in turn can have a negative impact on the perceived fun at work. Besides the low level of fun, the satisfaction with the own quality of work is also less for certified staffs than for nursing assistants. While around one third of nursing assistants is satisfied with the own quality of work only one fifth of all certified staffs states the same. In terms of working conditions, the differences between both job groups look very similar. While 7% of nursing assistants are fully satisfied with the conditions and 22% rather satisfied, only 3% of all certified staffs are fully satisfied and 19% rather satisfied. This result again, can be explained by the different areas of responsibility of both work groups. ﻿In practice, many certified staffs often criticize to not be able to meet the standards because of their constant time pressure. Besides its physical load a direct consequence of the lack of time is often a reduction in the quality of work. Besides its physical load lower quality of work can cause some serious psychological problems as well. In the long term constant psychological stress can even lead to an early job termination due to disability to work. Nursing assistants in turn, might face a lower pressure due to restricted responsibilities and different tasks. If we transfer the analysis to the general problem in healthcare the vicious circle in the German care sector especially comes to light. On one side we are dealing with a constant understaffing of certified staff which leads to an increase in physical and psychological stress on the other side. The existing staff is not able to meet the current standards, the working quality shrinks, again leading to a low self-esteem and further psychological stress. This stress again causes many nurses and caregivers to quit the job because of an inability to continue working. ﻿In the long term we do not only lack new personnel in the care sector - the early termination of current jobs needs to be taken into consideration as well. Furthermore, it should be taken into account that during the entire analysis the psychological stress of the patients has been disregarded completely.